The Apple Watch is unlike any other device you've used from Apple. When you look at the hardware and software that makes up the Apple Watch, you can clearly see the family resemblance, but there is something wonderful, yet mysterious about it. And so begins my journey with the Apple Watch. My Watch was delivered late on Friday evening, much later than most UPS deliveries. I started using it this weekend, but a family event kept me from diving head first into the wrist worn personal computer. Rather than racing to try and write a traditional review of Apple Watch as quickly as I can, I would rather spend the necessary time getting to know the new device and then write about it. The rest of this post will be devoted to the journey from placing my order to my first, raw impressions of Apple Watch. 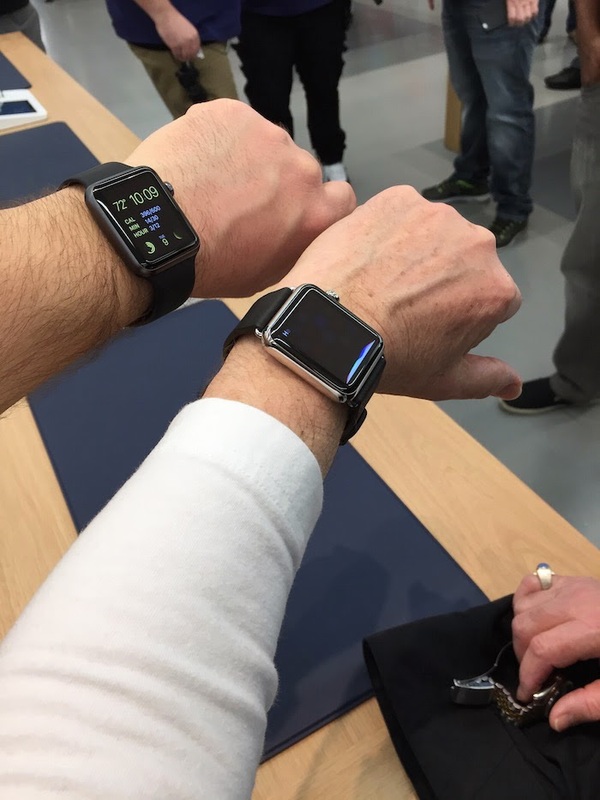 We all learned about the Apple Watch on September 9, 2014 during the iPhone 6 event. At about half way through the event, Apple CEO Tim Cook, borrowing a line from the late Steve Jobs dropped a now famous "One more thing..." slide. I was wearing a Nike+ FuelBand at the time. 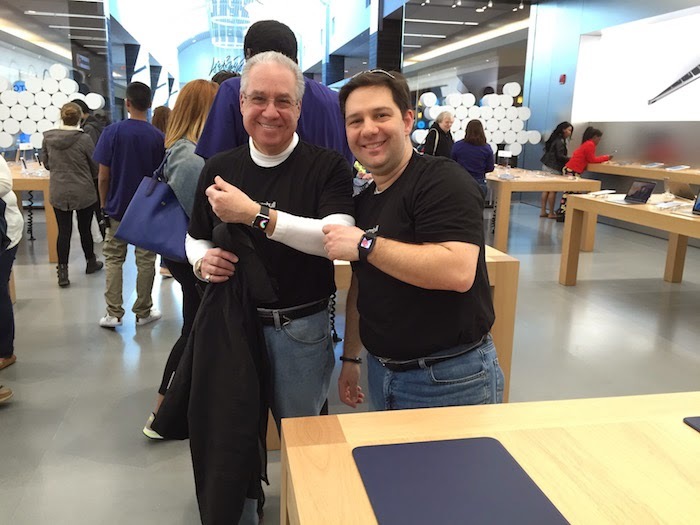 I was super excited about the Apple Watch. It was not only light years a head of what was on my wrist at the time, but what I guessed it might be. Six months later, on March 9, 2015, that we learned of the final details about the Watch during a special Apple keynote event. My Jawbone UP, which had more features packed into it than the FuelBand, suddenly felt old and outdated. Despite the initial positive reaction to Apple Watch, it wouldn't be until April 10, that we could pre-order and try on the Watch. Early adopters, willing to stay up late at night to pre-order, would have to wait at least another two weeks before they can slip theirs on for the first time. To me, this seamed like an unbelievably long lead up to Apple Watch: seven months from announcement to pre-order and another two weeks for Watches to start shipping. Not event the original iPhone had as long a lead time from announcement to shipping to customers. 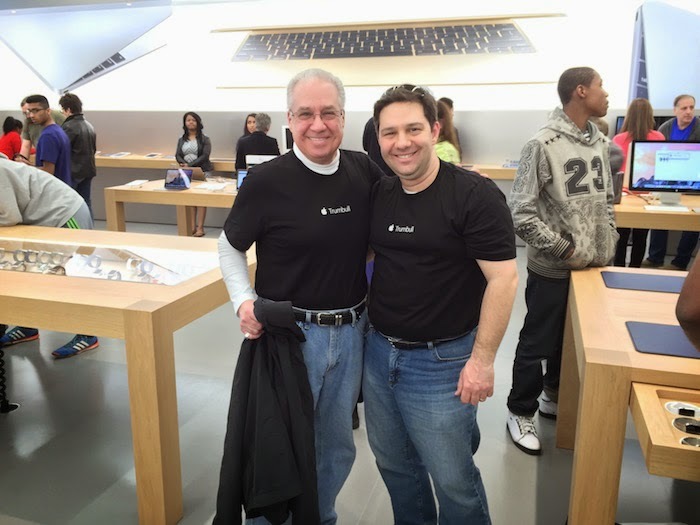 Fast forward to April 10 - the day that Apple would begin taking pre-orders for the Watch at 12:00am PDT (3:00am EDT for me) and welcoming customers into Apple Stores to try on Apple Watch before placing their online order. 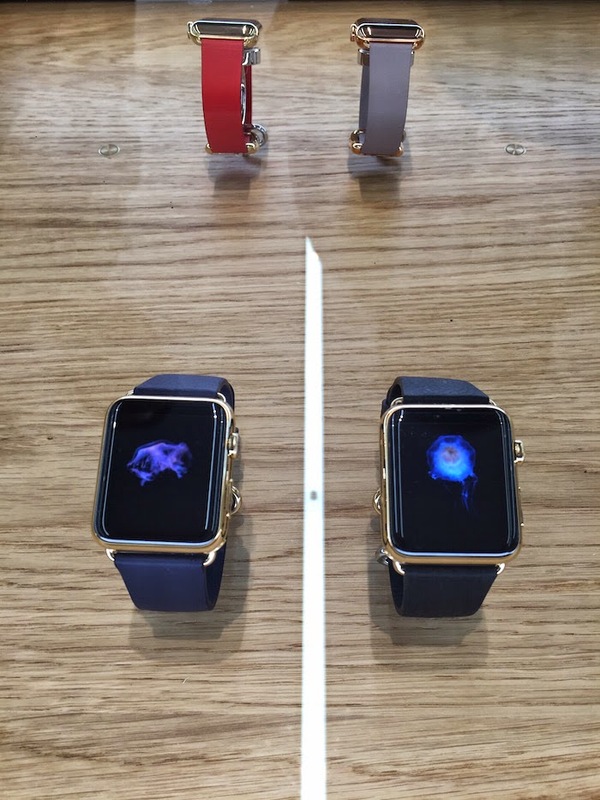 Apple had been warning that supplies of the Watch would be constrained at launch. Anyone who has ordered an iPhone in the last seven years knows that Apple always says that the latest new shiny toy (or business tool) would be in short supply during the first few weeks of availability. But this time was different. For whatever reason, this time, supplies of the new wrist-worn computers really where in tight supply. So much so, Apple tried to get out ahead of the public's expectations encouraging customers to place their orders online. I woke up at 2:50am that Friday morning. Not to head out to the Apple Store to stand in line. Apple made it clear that there would be no long lines wrapped around the block for the Apple Watch. This time, I was up to make sure that I was going to be in the first wave of the people would have Apple Watch. After suffering long delays trying to buy the iPhone 4S, iPhone 5S and iPhone 6 from Apple's website, which gets completely overwhelmed on pre-order day, I chose to use the Apple Store iOS app to order my Watch. Heading Apple's recommendation, I chose to "favorite" the Apple Watch I wanted to buy. At 3:00am I started refreshing the App Store waiting from the online store to go live again. 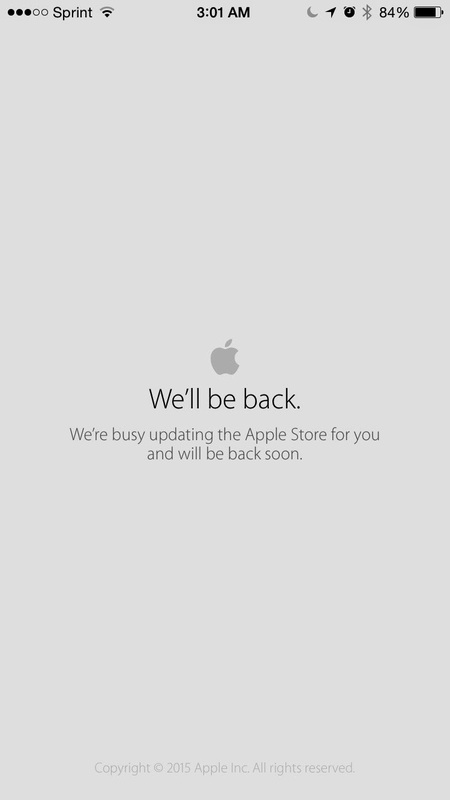 (Apple routinely takes their online store down when a new product is about to go live to update the CND servers around the world.) 3:01am...refresh...3:02am...refresh...3:03am...the page loads! I purchase my Apple Watch in two minutes without issue. My friends and family who also tried to order Apple Watch via the Apple Store at Apple.com tell me that the web servers where overloaded and not serving up pages properly. Let this be a lesson to you...if you want to get in and out quickly on pre-order day, use the iOS Apple Store app with Apple Pay. 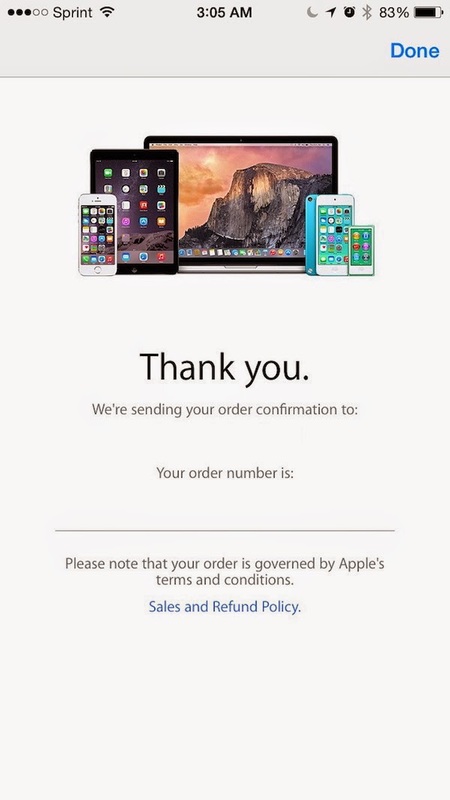 A few minutes later, I received my order confirmation email. 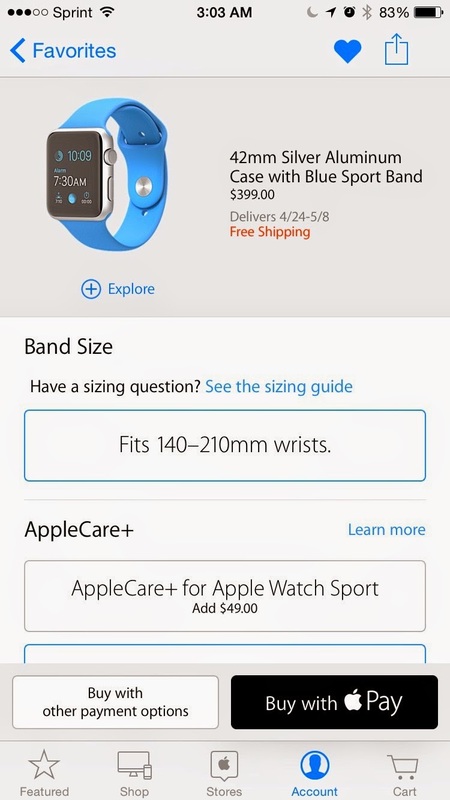 Just for fun, at 3:18am, I went back into the Apple Store iOS app to see what the lead time for the Apple Watch Sport edition watch with a blue fluoroelastomer band. I was surprised to see that in just 15 minutes, the watch I just ordered was back ordered 4-6 weeks! 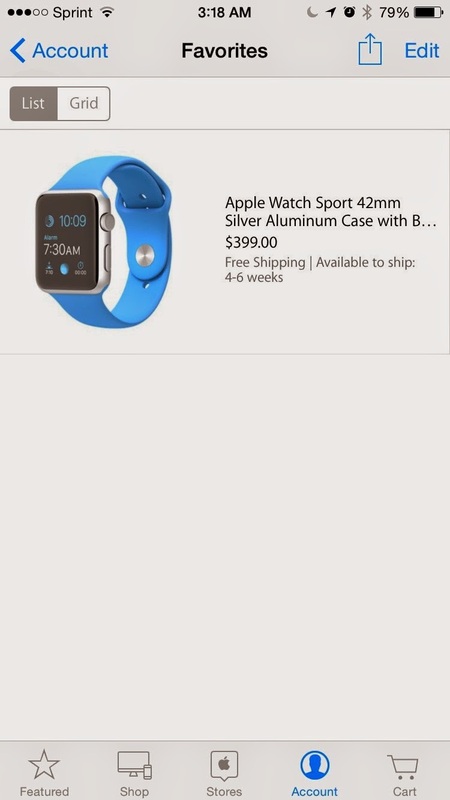 It looks like the Apple Watch Sport Edition will be popular and that supplies really are constrained. With my pre-order placed, it was time to schedule an appointment at the Apple Store Trumbull for a try on to make sure that the 42mm Watch wasn't going to be too big for my wrist or the band too loose or otherwise uncomfortable. I stopped wearing watches a long time ago, because I started to think that I have a weird wrist size. The watches I wore as a kit fit fine with their plastic or leather straps. When I started buying adult watches in my mid-twenties, the metal bands just didn't seem to fit right. With that in mind, I was a little bit hesitant to go back to wearing a watch, even one made by Apple, daily again. On Friday afternoon, I used the iOS Apple Store app, the one I had used hours before to place my Watch order, to book two appointments for my father and I to go try on my Apple Watch Sport Edition and his Apple Watch Edition. 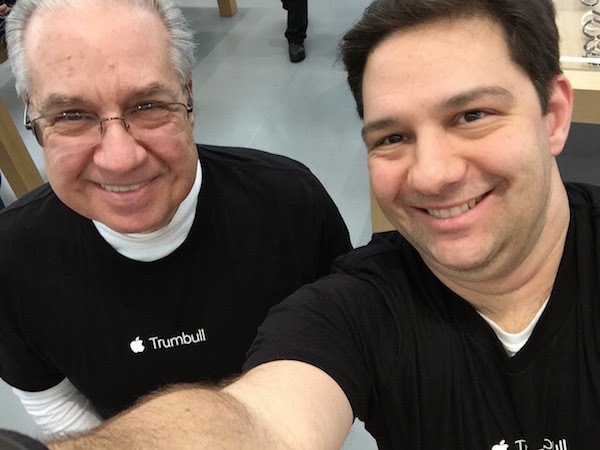 We also decided that we would wear the Apple shirts that we got from the Trumbull store's grand opening - just for added effect, because, really, where else are you going to wear your Apple t-shirt? 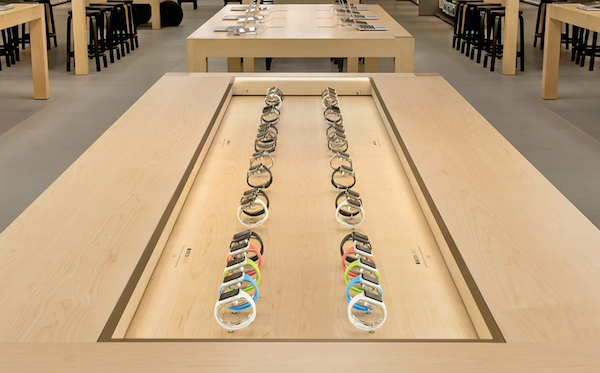 Upon arriving to the Apple Store, you quickly notice that the front tables have been changed out and now there are new tables specifically designed for showing off and having customers try on the new Apple Watch. When we arrived, we were quickly checked in by the Apple Store staff who also noticed our Apple shirts can called out "Original members are in the house!" It was a nice touch can throw back to that crazy Saturday morning when the store opened and pictures where taken for us by the staff. A few of them snapped a few pictures too - presumably for some internal use. And no trip to the Apple Store for a major product launch just wouldn't be complete without an Apple Store selfie! The Apple Watch has a really nice fit on my wrist and I'm no longer worried about a poor fit like I had on my $80-120 dollar "big boy" watches that I used to wear. The Sport band fit well and didn't feel cheap. 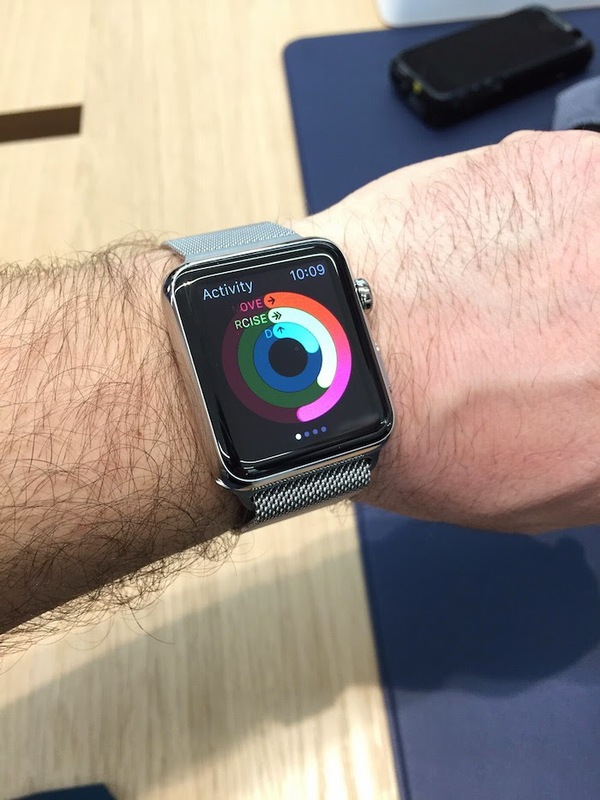 Far and away, my favorite watch has to be the Apple Watch, the stainless steel version, with the Milanese loop band. Having looked at my traditional watches, I was a little concerned about the scratches, so I chose to buy the less expensive aluminum Sport Edition. My dad did order the Apple Watch Stainless Steel with the classic leather band. Before out try on session was over, I did try on the Stainless Steel version with the Milanese loop band. The Stainless Steel version looks great and, as you would expect, the Milanese loop fits prety comfortably too. 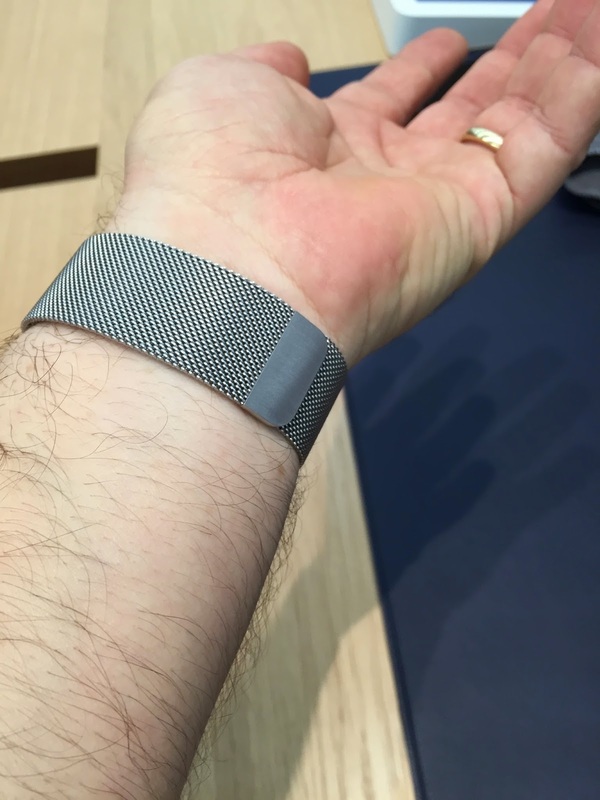 Like a few of the other bands, the Milanese loop band uses a special magnet to clasp close. The magnet holds pretty firmly and does not easily nudge or slide off, but it is still easy to open when you are ready to take it off. That should make a lot of people who are a little worried about the band coming unfastened during the day at ease. Even without a big splashy, lines around the block launch for Apple Watch, my dad and I still managed to get our new toys Apple Store tip in and even got to show off our Apple fan boy stripes too boot! Now, it's time to get down to saving pennies for the September iPhone launch!